Our Follow Up Request module is perhaps the most unique feature of the Security Patrol Track system! Many contracts have been lost because company management failed to follow thru on a client request, or because officers experienced a payroll issue and had no other way to express their frustration other than to complain to the client! 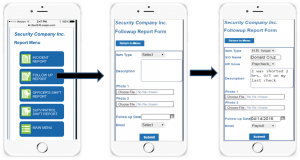 Our system provides a menu choice for field personnel to submit a request for a variety of items in a user defined drop down menu. The user can then assign a follow up date. Once submitted, the request is immediately emailed to a user defined address (i.e. Payroll, Supervisor, Ops Manager, etc.) and is entered into the database. Management can then review the request, assign a staff member to handle, make notes, change the follow up date and update the record…. 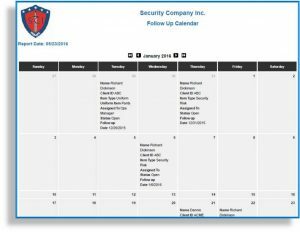 Management can view these items on a calendar by followup date to assure compliance with the requests! 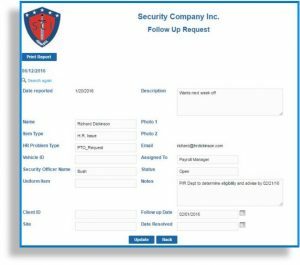 excellent, affordable security officer reporting software.